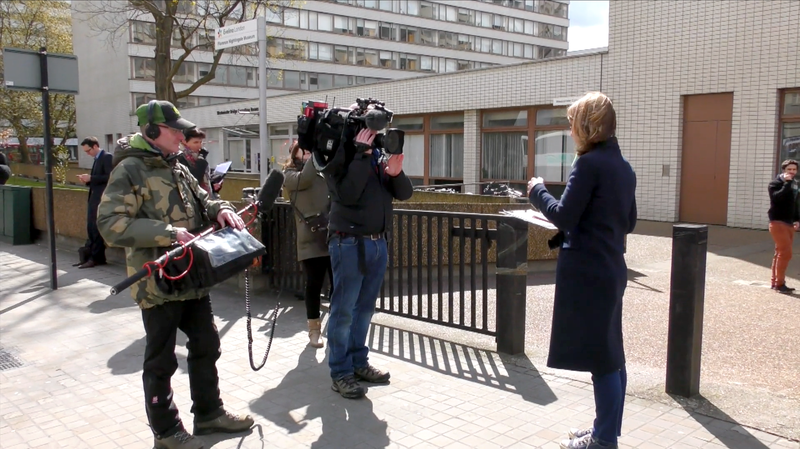 This is a short behind the scenes video filmed as Victoria Derbyshire presented her whole show from the Junior Doctor’s picket line outside St Thomas’ Hospital in Central London. We were tasked to film Victoria presenting the show using a single camera and one WMT transmission unit over the 4g mobile networks. Helped immeasurably by Engineer Andy Reed and the Victoria Derbyshire show team we managed to transmit successfully for the entire two hour show. There was a little bit of trepidation amongst the team as we had not relied on a WMT for much more that our usual quick live hits during the news bulletins, and in yesterdays case the program was being anchored by Victoria here on Location. Dealing with the harsh light and the sun going in and out (sometimes by as much as 5 stops), along with the noisy westminster traffic added to the challenge. However, I have to say that with some slick battery changes the WMT worked faultlessly. This is just a short piece showing what we got up to during the 2 hours on air.